COW Design is a design consultancy for small and medium enterprises (SMEs). We embed design as a core capability of a company. The tool of COW Design is created in such a way that it fits to the specific core capabilities of different clients, allowing it to create opportunities through design. Small and medium-sized firms have limited resources, but can be innovation leaders in their industry. Some examples in the industry leaders are Alessi, Artemide, Kartell, Flos, and B&B Italia (Verganti, 2007). Since they have a limited budget, they look for networks that have low access costs to help them by adding meaning to things. 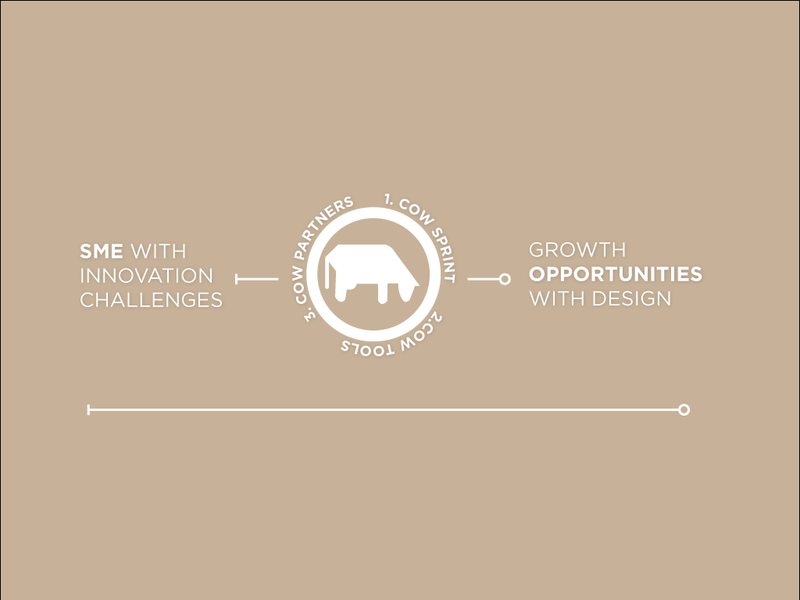 We want to offer such future innovation leaders an accessible collaboration with COW Design. There are various types of SMEs. More experienced SMEs are driven by profitability and stable long-term value. Younger SMEs, such as startups, are focused on top-end revenue and growth potential. Both parties are interesting choices where COW Design can offer a partnership for the future. This results in a win-win situation: they have innovation problems, and we as COW Design can help them by solving those issues. Market problems: Frequently missing points of SMEs are undefined value propositions or actions, such as those to convince the buyer to purchase a product.Targeting the right market can also become a pitfall. It often occurs that your selected market is not ready for your particular solution. Another mistake is the actual market size, which could not be large enough. Unprofitable business model: SMEs face cash scarcity and often lack a go-to-market strategy. Most entrepreneurs are optimistic, which is a positive attitude for starting a business. Unfortunately, such businesses often lack a business model for long-term steps. They usually do not realize that it takes more effort, time, and spending to acquire customers and gain a lifetime value. A plan including the steps needed to reach their future objectives is often not determined. Through design a strong and unique personality can be attached to product, which will stand apart from the crowd of undifferentiated competing products. Design contributes to the brand equity of a company. Product meanings and languages intimately determine users’ experience, this results in a direct impact on a company’s brand. A design-driven innovation enables a firm to include new archetypes of product meanings and languages. These can act as cultural standards, what people can use as a cue when buying a product in the same or a similar category. When a company involves a design-driven innovation it needs to incorporate specific knowledge of this topic. The firm will be the first to learn from this investment, and this knowledge will drive better results in the later development of incremental innovations. An increase of a product life-cycle saves companies from break-even fever, generates significant profits, eliminates the need for investments in continuous substitutions, and allows firms to focus their R&D budgets on more-substantial innovations. Most firms are aware of the fact that they need to understand user needs. The do ethnographic analysis, and organize brainstorming sessions; and if they cannot accomplish that, they involve a design consultant. However, they do not know how to implement it. They lack of a starting point, and they have no capabilities when it comes to radical innovation of meanings, which requires them to step back from close observation of people’s current needs. Therefore, design can add its value by integrating all these different aspects into one holistic product development plan. COW Design is a strategic design consultancy and an innovation network for entrepreneurs who want to position themselves as market leaders in their sector through design and innovation. We embed design and meaning. We do not stop after delivery. COW Design collaborates with SMEs, including startups, in embedding design as part of their core capabilities to give them a competitive advantage in developing sound products and services that their customers want/love to use. This sprint has a duration of one week. A basic process for new product development (NPD) is settled in five phases: company analysis, user understanding, idea development, concept validation and project implementation. These five phases are linked to five moments (the results after each phase) in NPD, where design can bring strategic value to a company. One week is quite limited to include more options to design a new product, service or strategy. Therefore, COW Design offers a summary of “not-for-nows” for each phase to its clients. COW Design deals with various problems of SMEs, often they encounter difficulties in their branding, product, strategy or identity. The “not-for-nows” include these directions as food for thought. This could trigger clients to extend the collaboration with COW Design and strengthen their company into the market. As mentioned in its positioning, COW Design does not stop after delivery. By integrating design in the core capabilities of the clients it will be interesting for them to choose to do the second step of the menu. During the initial step of the sprint the client received some basic steps from COW Design’s tool. However, this was only a quick version of the actual tool. In step 2 the client will use the “not-for-nows” to develop their concepts into concrete products, services, and strategies. The process of the five phases is an iterative process (Smulders et al, 2008) and functions as an on-going learning process (Kolb, 1984). COW Design will guide its client to elaborate on the “not-for-nows”. The design consultancy will cover problems such as brand equity, positioning, strategy, and product, dependent on the available time (between 3 to 6 months). COW Design will analyse the current situation of the SME and establish options for a future vision. Problems for this first step may occur in its identity, brand equity, positioning or product. Here, COW Design offers different directions to their clients. Eventually they will make a decision in these options. The rest will be summarized in the “not-for-nows”. During this part a style will be defined. This is necessary for a selective focus of mental capacity on a particular object (Person et al, 2007). This can be done by attention drawing: the product or service styling has to capture and maintain the attention of customers before they can derive information from it (Schoormans and Robben, 1997). Defining a style can act as a cue to help consumers recognise and relate products and services to others, which belong to the same period, lifestyle segment, or brand (Kreuzbauer and Malter 2005; Pugliese and Cagan 2002; Underwood 2003). It is noted that people also attach meanings to a product by recognising it through its styling as belonging to a certain class of products (Person et al, 2007). Thus, new styles acquire their initial meaning in a personal setting, but influential individuals (or influential companies) can create cultural meaning for a new style.Therefore, it is important to stated a concrete style for a company. This can be communicated through their identity, positioning, brand activities or product. The company analysis is part of the inspiration phase described by Brown (2005), in this phase you look at the problems in the business phases. Context is also something that is looked at, and the inspirations are used to come up with ideas for the next phase. User understanding is part of the inspiration phase described in the article by Brown (2005). By looking at the user and taking a human-centered approach you can empathize with the user and this will give inspiration for new ideas in the next phase. Understanding the market and the customers is of great importance in order to develop successful products, this can be done by empathizing with customers. In this step the ideation phase (Brown, 2005) will start, the inspiration will be formed into ideas. Requirements are set derived from the company analysis and the user understanding to validate the concept. The concept validation step belongs to the ideation step, where we conceptualize ideas and validate them by making prototypes and translate this back to our target market. Project implementation is the final step where we implement the innovation into the market. Brown (2005) describes this as the implementation phase in which the new vision of the company is executed. COW Design embeds design as core capabilities of the client’s firm. This is an iterative process, which creates opportunities to reinforce the creative industry and the business of our clients. A continuous collaboration with COW Design could therefore be of great value to those SMEs. Thus, COW Design offers a partnership, in which it invests in the selected firms in order to make them grow. This will result in an investment for both parties: the client will receive the design knowledge that suits their core capabilities, and COW Design will have a share of their profits. This complete program of COW Design will be costly for the ones that recently started their own company. However, COW Design has an interest for startups as mentioned earlier. To establish a pool of clients and partners COW Design collaborates with DCE, Delft Centre of Entrepreneurs. The startups can participate in the sprint as well. After this collaboration it can be discussed with both parties if a partnership will be a sought opportunity. Eventually COW Design wants to create its own platform for its partners. This gives access to firms to find other partners. An example is to connect talented design students with other entrepreneurs. COW Design selected these designers which will offer opportunities for their current clients and partners. This enables us to establish a client source for COW Design: it positions itself as a business incubator for entrepreneurial support. COW Design reinforces the creative industry by embedding design in the core capabilities of its partners and clients. The tool is tailored to the specific core capabilities, allowing it to create opportunities through design. During a collaboration with COW Design, the objective is set to position our clients as market leaders who know how to use their core capabilities in design to gain competitive advantage. It also seeks to stimulate design students to cooperate with COW Design; an expert in design consultancy. MILK is a startup that contacted COW Design through Delft Centre of Entrepreneurs (DCE). What they want to achieve is to make drinking milk “cool” for young adults from 20-25 years. Therefore, they want to distinguish milk from the traditional packaging and branding. What COW Design finds interesting is that MILK wants to position their drink differently than the traditional version. This case can create an opportunity for an innovative branding, re-positioning, product and identity. Their branding does not fit with the product. Refilling the bottle of the drink happens often. These findings will help COW Design in the idea development. 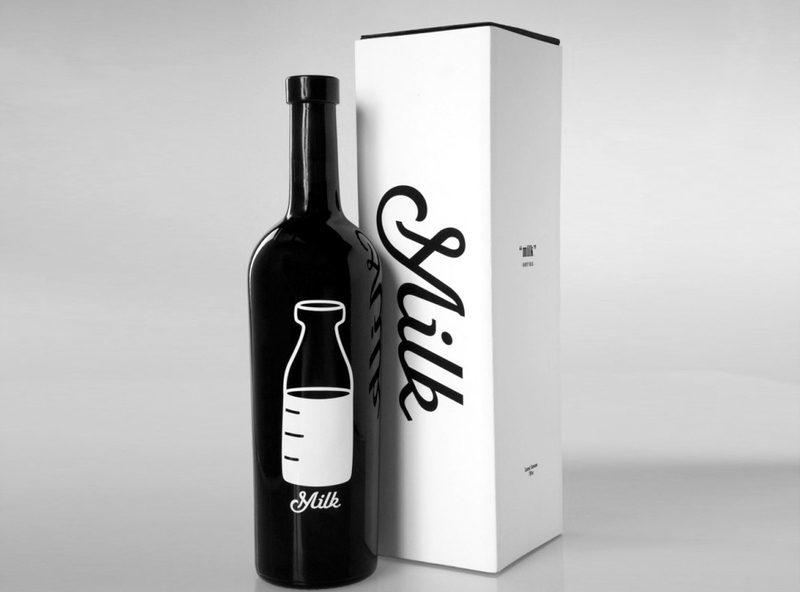 Together with their client MILK it is decided to focus on refilling the bottle, since this one will be more appealing to the end-users. The “not-for-nows” are ideas that elaborate more on refilling a drink, such as refill places and potential selling points. To validate the concept COW Design made sketches and showed these to the target group. Comments are used and implemented to optimize the concept. For the “not-for-nows” a pilot with a model is an option. MILK will be responsible for the implementation part for this sprint. However, COW Design will deliver a model, such as a 3D print to help them in realizing the end product. The design consultancy also offers a summary of the “not-for-nows”. If MILK is interested in applying these “not-for-nows” they can choose for the second step COW Design offers, which is a collaboration of 3-6 months. MILK decided to do the second step as well. After a close collaboration with COW Design they have concrete concepts and prototypes. This was a positive experience for both parties and therefore, COW Design offers a partnership with MILK. The client receives a small investment from the design consultancy. When MILK receives their first profits, COW Design will receive a percentage as a repayment of the investments. Kolb, D.A. (1984). Experiential learning. Prentice- Hall. Englewood Cliffs, New Jersey. Kreuzbauer, R. and Malter, A.J. (2005), “Embodied cognition and new product design: Changing product form to influence brand categorization”, Journal of Product Innovation Management, Vol. 22, No.2, pp.165-176. Person, O., Snelders, D., Karjalainen, T.M., Schoormans, J. (2007), “Complementing intuition: insights on styling as a strategic tool”, Journal of Marketing Management, Vol. 23, No.9-10, pp. 901-916. Schoormans, J.P.L. and Robben, H.S.J. (1997), “The effect of new package design on product attention, categorization and evaluation”, Journal of Economic Psychology, Vol.18, No. 2-3, pp. 271-287. Smulders, F., Lousberg, L., Dorst, K. (2008), “Towards different communication in collaborative design”, International Journal of Managing Projects in Business., Vol. 1 No. 3, pp. 352-367. Pugliese, M.J. and Cagan, J. (2002), “Capturing a rebel: Modeling the Harley-Davidson brand through a motorcycle shape grammar”, Research in Engineering Design – Theory, Applications and Concurrent Engineering, Vol.13, No.3, pp. 139-156. Underwood, R.L. (2003), “The communicative power of product packaging: Creating brand identity via lived and mediated experience”, Journal of Marketing Theory and Practice, Vol. 11, No.1, pp. 62-76.